Follow the steps below, and you can convert Flip Video HD MP4 to iPhone 4 for Playing. Step 1. Load Flip Video Full HD MP4 videos to Aunsoft Flip HD Video to iPhone 4 Converter. Transfer the HD MP4 files from Flip Ultra, Flip MinoHD (2hrs), or Flip SlideHD, etc to Windows computer hard drive via USB cable, run Aunsoft Video Converter as the Flip HD Video to iPhone 4 converter, then drag and drop or click the "Add" button to load HD MP 4 videos. Step 2. Choose iPhone 4 H.264 720p (*.mp4) as output format. Step 3. 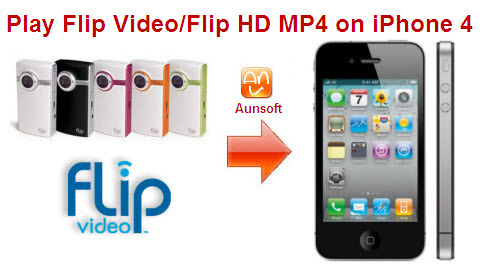 Convert Flip Video Full HD MP4 to H.264 MP4 for iPhone 4. Click the convert button under the preview window, and the conversion from Flip HD Video MP4 to iPhone 4 MP4 will start immediately. While the conversion is finished, just sync the output 720p videos to iPhone 4 via iTunes.